NEW ORLEANS — It’s the biggest weekend of the NCAA Division I Indoor Track & Field regular season with incredible meets schedule to take place in Arkansas (Tyson Invitational), New York (NYRR Millrose Games), Washington (Husky Classic) and everywhere in between. 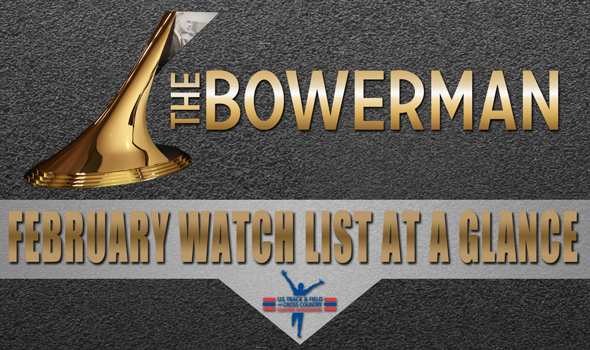 With that being said, it’s time to check out where members of The Bowerman Award Watch List will compete. The most recent Watch Lists came out the first two days of February and are presented by the U.S. Track & Field and Cross Country Coaches Association (USTFCCCA). Collegiate records could very well fall this weekend, which would only bolster an athlete’s chances of winning the highest individual honor in collegiate track & field. The Bowerman Award will be given out in December at the USTFCCCA Convention in Phoenix, Arizona. Edward Chesrek, Oregon – King Ches is scheduled to double up this weekend at the Husky Classic. Cheserek will face a strong field in both the mile and 5000. A pair of Cheserek-like races should set him up for a prospective triple (Maybe even quadruple!?) come NCAAs. He already has a top-2 mark in the 3000 from the Columbia East-West Challenge and helped the Oregon men to the top mark in the DMR. Christian Coleman, Tennessee – The NCAA and world leader at 60 and 200 meters heads to Clemson, South Carolina this weekend. Coleman will only run the 200 at Clemson’s Tiger Paw Invitational and should lower his indoor PR of 20.49. Last week Coleman ran the 8th fastest time over 60 meters in collegiate history (6.51). Isaiah Harris, Penn State – Harris, one of three new additions to The Bowerman Watch List, will compete in his signature event — the 800 — at the 2017 SPIRE Division I Collegiate Invitational this weekend. The Penn State sophomore recently ran the 2nd fastest 600-meter time in world history. Grant Holloway, Florida – Holloway, one of three new additions to The Bowerman Watch List, is the NCAA leader in the long jump (8.05m/26-5) and is tied for 2nd in the 60 hurdles (7.63). The freshman will compete in both at the prestigious Tyson Invitational. Emmanuel Korir, UTEP – Korir, one of three new additions to The Bowerman Watch List, will compete in the DMR at the Music City Challenge this weekend. The UTEP freshman currently leads the NCAA in the 800 (1:46.15A) and once held the 600 meter all-time world best. Filip Mihaljevic, Virginia – Mihaljevic, currently tied for 4th in the nation in the shot put (19.47m/63-10½), is not scheduled to compete this weekend. Byron Robinson, Texas – Robinson made his debut this past weekend at the Frank Sevigne Husker Invitational and ran the 11th fastest time in the nation over 400 meters (46.68). He will compete in that same event at the Tyson Invitational. Curtis Thompson, Mississippi State – Thompson, a javelin thrower, will not compete until the outdoor season. Lindon Victor, Texas A&M – Victor will compete in both the long jump and shot put at the Clemson Tiger Paw Invitational one week after setting a PR in the heptathlon. Rudy Winkler, Cornell – Winkler, currently 2nd in the nation in the weight throw (23.32m/76-6¼), is not scheduled to compete this weekend. Quanesha Burks, Alabama – Last weekend, Burks won the women’s long jump and 60 meters at the LSU Bayou Bengal Invitational. Burks will focus solely on the long jump at the Tiger Paw Invitational at Clemson this weekend, as she looks to repeat as the NCAA Division I Indoor Track & Field Champion in the event. Hannah Cunliffe, Oregon – The Division I leader in the 60 meters is slated to compete against four of her Oregon Duck teammates at the Don Kirby Invitational in Albuquerque, New Mexico. Cunliffe also owns the 3rd-fastest 200 meter time in Division I, another event in which she will compete over the weekend. Kaela Edwards, Oklahoma State – Edwards is the lone member of the 2017 February Bowerman Watch List who will take part in the prestigious NYRR Millrose Games. After breaking the collegiate record in the 1000 meters in mid-January, the Highlands Ranch, Colorado, native will set her sights on the Wanamaker Mile — and the collegiate record in the mile — at the The Armory in New York City. Keturah Orji, Georgia – The only woman on the 2017 February edition of the Bowerman Watch List to solely participate in jumps, Orji is entered in the triple jump at the Vanderbilt Music City Challenge. Raevyn Rogers, Oregon – Rogers has a relatively light load this weekend compared to her Bowerman counterparts, but don’t expect her to take her role lightly. The current 800 meter pace setter will anchor the Ducks’ 4×400 relay squad along with Makenzie Dunmore, Deajah Stevens and Elexis Guster at the Don Kirby Invitational. Raven Saunders, Mississippi – The weight throw and shot put competitions at the Music City Challenge will feature Saunders. The native of Charleston, South Carolina, sits atop the Division I leaderboard in the shot put on the season and owns nine of the top-10 marks in the world this year. Deajah Stevens, Oregon – Stevens is entered into three competitions at the Don Kirby Invitational: the 60 meters, the 200 meters and the 4×400 relay. She holds the top mark in the nation right now over 200 meters (22.65), with USC’s Deanna Hill a full .29 seconds behind her in second. Sasha Wallace, Oregon – Just two weeks ago, Wallace set the nation’s top mark in the 60 hurdles with a time of 7.91. Wallace looks to continue to build on her senior season with a strong performance at the Don Kirby Invitational. Ariana Washington, Oregon – Like teammate Cunliffe, Washington will run in the 60 and 200 this weekend at the Don Kirby Invitational. The redshirt-sophomore from Signal Hill, California, sits 8th in Division I in the 200 meters (23.16) and is tied for 15th in the 60 meters (7.30). Kendell Williams, Georgia – The lone combined event participant on the 2017 February Bowerman Women’s Watch List, Williams has her work cut out for her at the Vanderbilt Music City Challenge. In Nashville, Williams is scheduled to compete in the 60 hurdles, the long jump and the shot put.